Vatayana - moving with the wind, horse, wind horse. Guru - venerable one, teacher, preceptor of the gods. We offer a 100 hour Vatayanaguru Leadership Training or Horse as Teacher course. 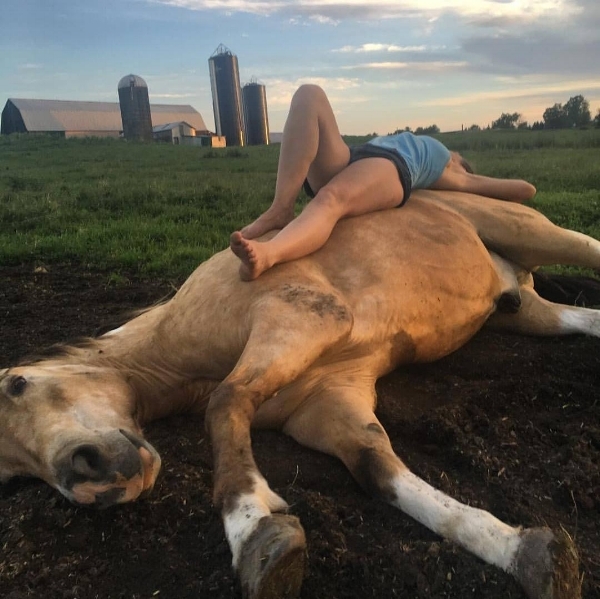 Participants will work with Nandi's horses learning to understand horse communication, ashtanga yoga philosophy and how it creates a framework to work with horses. Physical & emotional care, managing people around horses, basic safety, how to facilitate Yoga sessions with equines and much more will be covered. 50 hours are dedicated to care taking. 50 hours are dedicated to Yoga, Meditation, Music, Art, etc. Cost is $1200. Individual session lengths vary depending on weather and life schedule. The first step in this program is to meet the horses. Nandi Animal Rescue is the formalization of a lifetime pattern of rescuing animals, especially Horses. Our mission is to keep Vermont's retired and over looked Horses in state to live out their days with love and companionship. Many of these Horses enjoy people and become yoga horses, family horses or pasture mates. Some need to regain health, trust or equine companionship first. Nandi Animal Rescue supports Vermont Horses through life changes that threaten safety, health and regular care. Kathy McNames grew up with horses, learning natural riding skills from her Grandfather. This rescue/yoga/community farm work is both her passion & comedic relief.